Also Called: Slender-leaved mountain mint, narrowleaf mountain mint. Stems: Erect, square, glabrous or angles sometimes minutely pubescent; upper portion branched. Leaves: Opposite, sessile, linear or linear-lanceolate, .6 to 1.4 inches long, less than .25 inch wide, glabrous; margins entire, minutely fringed; tips narrowly pointed. Inflorescences: Clusters, small, dense, 1/6 to 1/3 inch wide, solitary, terminal, arranged in compact corymbs. Flowers: Sessile, calyces regular, tubular, 5-toothed, 10- to 13-nerved; teeth narrowly triangular, much shorter than tube; corolla whitish or occasionally pale lavender, 1/5 to 1/4 inch long, slightly 2-lipped, whitish-pubescent without, lightly pubescent within, much exceeding calyx; lips nearly equal in length; upper lip erect, entire or notched; lower lip bent downward, 3-lobed, purple spotted, middle lobe longer; stamens 4. Fruits: Nutlets, egg-shaped or oval, 3-sided, dark brown, usually smooth. Habitat: Moist open areas of upland prairies, meadows, pastures, open woods, and roadsides; limestone soils. 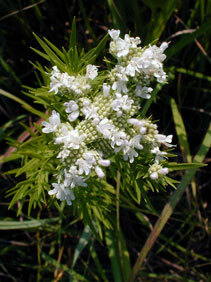 Uses: Some species of Pycnanthemum have been used medicinally to treat colds and fevers. Comments: Often forms dense colonies.